Capture to AVI in real-time using any DirectShow compatible codec. Pre/Post Recording with variable Pre and Post duration. Pre/Post Triggering using pulse generator, with automatic rearm feature . 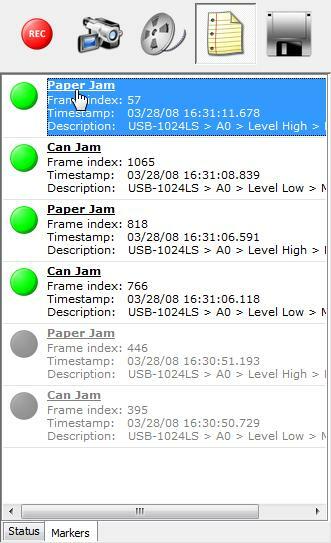 Multiple event marker: mark a specific frame upon receipt of trigger. Lossy JPEG and Lossless JPEG video compression available using RLE, Huffman and LZ algorithms. Provides a quick save/export method by auto-generating file names based on a user defined filenaming scheme. Before a recording starts, TroublePix automatically detects the maximum sequence length in time or number of frames, relative to the available disk space or RAM on the computer. Allows to record and hold multiple sequences in memory, depending on the available amount of physical memory. When used with Auto-Rearm feature, the current sequence is automatically saved on disk before re-arming the system. Focuses on recording images only around a Pre/Post trigger event. Can optionally locate the Pre/Post event using a marker after loading a sequence.